Southern California’s hot, dry summers can be absolutely devilish on your garden. 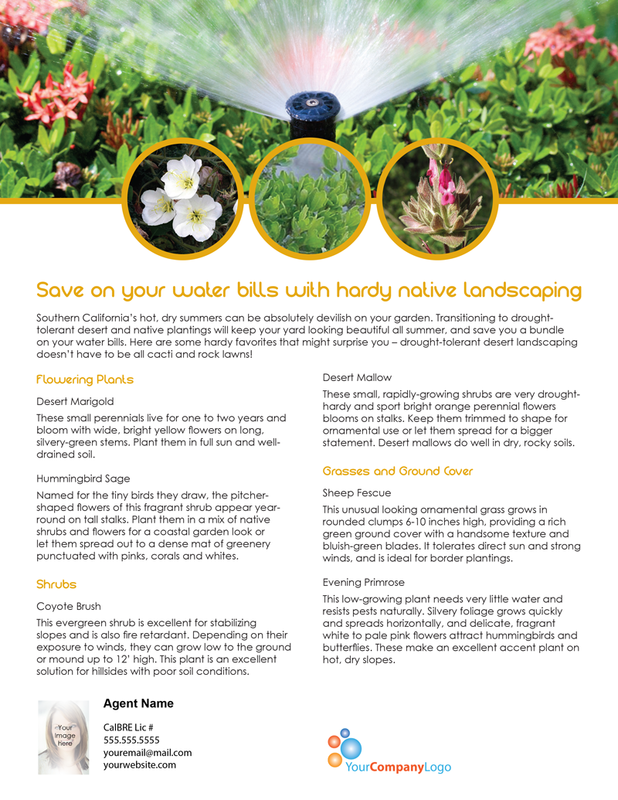 Transitioning to drought-tolerant desert and native plantings will keep your yard looking beautiful all summer, and save you a bundle on your water bills. 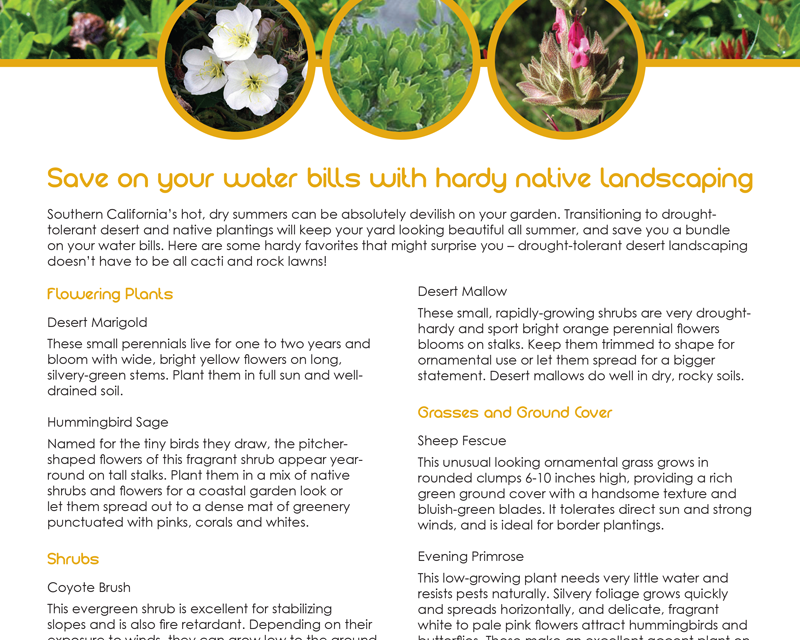 Here are some hardy favorites that might surprise you – drought-tolerant desert landscaping doesn’t have to be all cacti and rock lawns! These small perennials live for one to two years and bloom with wide, bright yellow flowers on long, silvery-green stems. 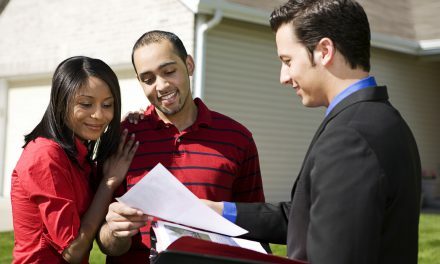 Plant them in full sun and well-drained soil. Named for the tiny birds they draw, the pitcher-shaped flowers of this fragrant shrub appear year-round on tall stalks. Plant them in a mix of native shrubs and flowers for a coastal garden look or let them spread out to a dense mat of greenery punctuated with pinks, corals and whites. This evergreen shrub is excellent for stabilizing slopes and is also fire retardant. Depending on their exposure to winds, they can grow low to the ground or mound up to 12’ high. This plant is an excellent solution for hillsides with poor soil conditions. These small, rapidly-growing shrubs are very drought-hardy and sport bright orange perennial flowers blooms on stalks. Keep them trimmed to shape for ornamental use or let them spread for a bigger statement. Desert mallows do well in dry, rocky soils. This unusual looking ornamental grass grows in rounded clumps 6-10 inches high, providing a rich green ground cover with a handsome texture and bluish-green blades. It tolerates direct sun and strong winds, and is ideal for border plantings. This low-growing plant needs very little water and resists pests naturally. Silvery foliage grows quickly and spreads horizontally, and delicate, fragrant white to pale pink flowers attract hummingbirds and butterflies. These make an excellent accent plant on hot, dry slopes.